As one of the principal dairy-producing towns in Plymouth County in the early 20th century, Middleborough saw much of the milk produced in town shipped daily to neighboring communities. In 1913, a number of Middleborough dairymen sent milk in eight-quart cans to nearby Onset by means of the electric trolleys operated by the New Bedford & Onset Street Railway Company. The arrangement whereby fresh milk was sent to Onset each morning and the empty cans returned later in the day eventually created a troublesome nuisance when the unwashed cans were dumped off the returning trolleys near the Four Corners, leading a correspondent of the Brockton Enterprise to report the following story in late July, 1913. There is a merry mix-up over milk cans here. Local milk producers send about 70 eight-quart cans of milk to Onset each day, for consumption by the Summer people. The milk is shipped on the trolley line, and the empties used to come back in the same way. The cans, on arriving here, are thrown about the Four Corners, along the gutters and littered the place. Chief of Police Swift ordered the practice stopped, and also forebade the bakerymen who sent boxes of foodstuffs, having their empty boxes along the street. No provision has been made for a storing place for the empties here. so the trolley line did not return the 70 or more empty cans this morning. The milkmen were loudly calling for the cans, and held indignation meetings beside the cars. At Onset the empty cans are lined up next to Flagstaff sq. and the health authorities are anxious to have them moved. It is claimed that they were not scalded. A conference is scheduled for later in the day to devise means of solving the problem. The solution ultimately settled upon was that the trolleys would return the empty milk cans to Middleborough where dairymen were expected to be on hand to claim them at the Middleborough terminal. "When no one is on hand to receive them the cars start for Onset again, and make a round trip later in the day." Small cans like the one pictured in this advertisement were typically employed by local dairymen to ship milk to local residential and commercial customers. The eight-quart cans in use by Middleborough dairymen who sent milk to the summer residents in Onset and elsewhere, ultimately caused a disturbance in town in 1913 when they were deposited by the street railway in the roadways and along the sidewalks in the center of town. 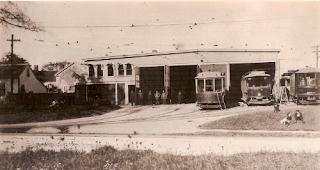 Originally built for the Middleboro, Wareham & Buzzards Bay Street Railway, this car barn was later used by the M, W & B. B. 's successor, the New Bedford & Onset Street Railway Company as its Middleborough terminal. Though little realized today, the trolleys - like the steam railroads - were heavy transporters of freight, including milk. The car barn was later owned by the Maxim Motors Company, and still stands near the corner of Wareham and Lincoln Streets.